Whole year long here in the Red Sea Hurghada Egypt is the right time for daily diving. The beauty of the Red Sea is unspeakable, everyone should visit this place to see it with their own eyes: the sun and water temperature makes it possible whenever you want. The biggest variety of the dive sites you will find in Hurghada area, over 40 of them to make you busy and explore the beauty of the Red Sea: drift dives, wreck dives, night dives, deep dives, drift-pickup dives, diving safaris, visit reefs, drop-offs, coral gardens and so much more. The Red Sea is definitely the place to be added to your bucket-list. I invite you to explore diving in the Red Sea together, no matter which level you are, we always will find for you the best dives and conditions to help you to fall in love with diving even more. This section is designed to give you a clear idea on range of PADI dive courses, I offer. No matter in front of which door you are standing right now: beginner or starting your professional path in diving - your life will change for better and forever. Use your opportunities, make your dreams come true. You have everything you need to make it happen: great tools to use to achieve your goals, strong educational system, quality and safety standards, my support and knowledge, nice warm climate of Egypt, inspiring under water world of the Red Sea. You will fall in love with this universe beneath the waves; it is not just under water world it is also new you. Use the chance to explore and discover yourself in different dimension. It will affect everything, including your daily life. All of it… is the magic of diving. Who am I? Earthling – first of all… lucky one, having a chance to do every day what I love. I am a PADI Course Director teaching all diving courses from beginner to professional levels, sharing my experience and always discovering and learning something new with each student. 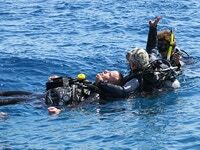 This website is designed to provide you with detailed information about diving courses from beginner to a professional levels, offered services. As you can see this website is still in progress, more chapters will be developed and added. All listed courses are available for you. Do not hesitate to contact me, if you are interested in conducting a diving course which is not published yet. If you have any suggestions, ideas, comments about the website, please use the contact form or email address provided below. Thanks to everyone who gave their permission to be on the pictures used here, if you find yourself on the picture and you do not want to appear on this website, please use the contact form below. Diving is about getting closer to the nature, witnessing how genius is our planet. In diving we realise so quick what treasure we have, how powerful the ocean is, but in the same time, how fragile it can be with all negative impact, which comes from us - humans. What does it take, to be a human? Humans can make wise-full decisions, which are not always easy to make, standing for your values, trying to do something, might be even small in the big scale, but so crucial and important for better tomorrow. No matter where we are and how far we are from the ocean, we always can find the way to be a part of it, giving back and being thankful for the chance to witness the beauty of this planet. That’s why we are humans, we can value those things and take actions to make it better tomorrow. Diving in Hurghada, Egypt, Red Sea, gives us great opportunity to see the complete picture, giving us so many chances to act already today, spread the word, show example. Lets do it together, lets proof that everything is possible, everything is in our hands. Google Analytics is a web analytics service provided by Google. Google uses the data collected to track and investigate the use of this Site, create activity reports and share them with other Google services. Google can use the data collected to contextually personalize and personalize ads on its own network. Personal data collected: cookie and usage data. Place of data processing: USA.